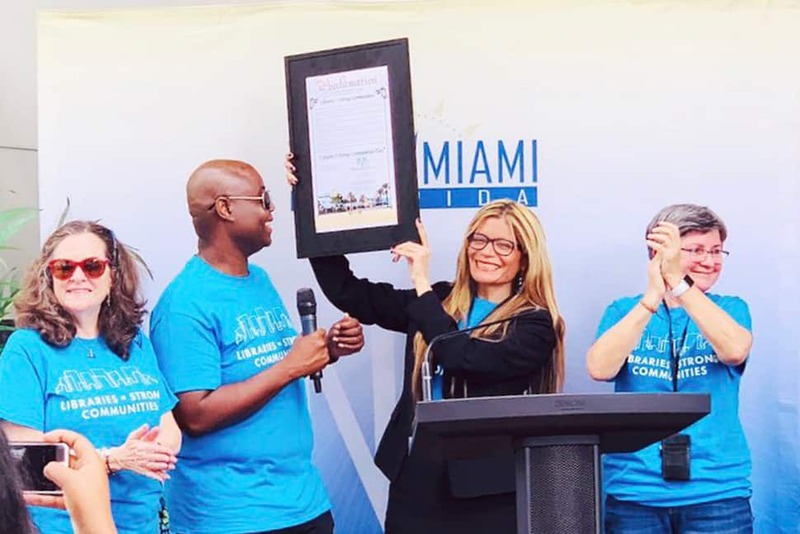 ALA President Loida Garcia-Febo holds a proclamation from the city of North Miami, Florida, during a Libraries = Strong Communities rally at North Miami Public Library February 9. From left: Councilwoman Carol Keys, Councilman Alix Desulme, Garcia-Febo, and Library Director Lucia Gonzalez. American Library Association (ALA) President Loida Garcia-Febo’s Libraries = Strong Communities tour came to North Miami (Fla.) Public Library (NMPL) on February 9 for a rally that helped kick off the library’s Black History Month Community Celebration. NMPL has experienced a dramatic transformation, recently finishing a renovation that included the addition of new public computers, interactive learning devices, and a multipurpose area for classes and workshops. Garcia-Febo closed the proceedings by praising the library for such resources as Career Online High School for residents 19 and older, summer reading programs, and English-language classes. 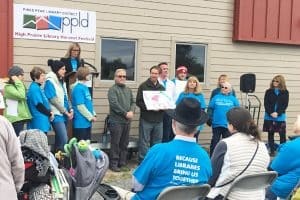 “This library is bridging the digital divide by allowing patrons to access new content from home,” offering online classes, databases, ebooks, music, movies, and more. 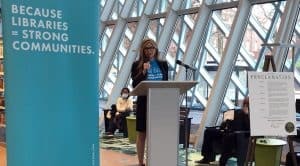 Garcia-Febo used the event as an opportunity to speak on behalf of school librarians and called for full funding for public and academic libraries. The visit to North Miami was among the highlights of a three-day series of visits to both public and academic libraries. On February 8, Garcia-Febo visited Hubert Library at Florida International University’s (FIU) Biscayne Bay Campus. She met with academic librarians from FIU collaborating with NMPL, the local historical society, and Barry University to preserve historical documents and photos. On February 10, she attended the North Miami Beach Public Library’s Literacy Fair, where North Miami Beach Mayor Anthony F. DeFillipo delivered a proclamation recognizing the Libraries = Strong Communities initiative as well the work of the North Miami Beach Public Library and Director Edenia Hernandez, mentioning, among other achievements, its technology classes and cutting-edge STEAM programs. Update: The photo caption originally said NMPL was in North Miami Beach, not North Miami. The caption has been corrected.